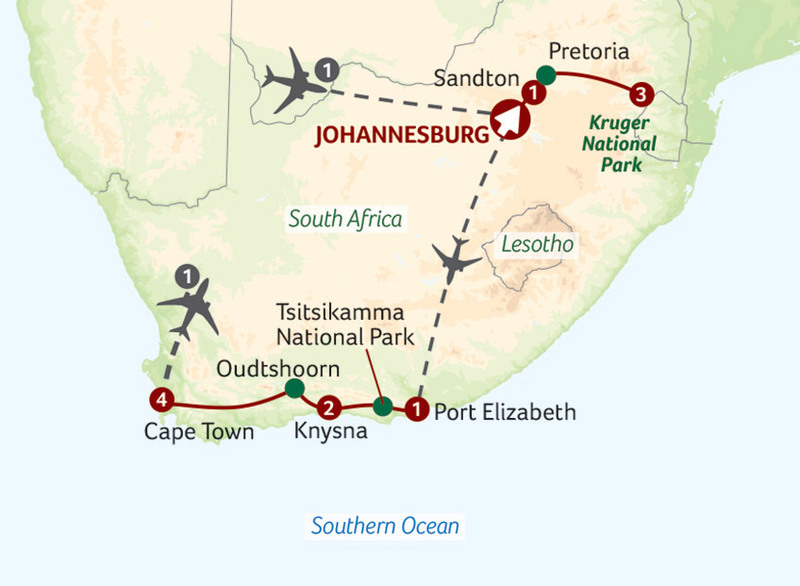 With opportunities to explore breathtakingly beautiful coastlines and iconic cities, admire views from mountain summits and track the ‘Big Five’ on safari, South Africa can justifiably claim to offer ‘the whole world in one country’. Immerse yourself in this ever-enthralling land on this superb value, fully escorted tour of its three top attractions, each an icon of world travel in its own right. Enjoy spectacular wildlife-watching in Kruger National Park, a journey along the glorious Garden Route and four nights in Cape Town, the African continent’s most attractive city with a host of holiday pleasures on its doorstep. Titan’s VIP door-to-door travel service collects you from home, for your journey to London Heathrow Airport for a direct, scheduled South African Airways flight to Johannesburg. On arrival into Johannesburg we embark on an orientation tour of Pretoria, which will include a stop at the substantial hilltop monument that commemorates the settling of South Africa’s interior by the Boer pioneers, known as Voortrekkers. We stay overnight at the Protea Balalaika Hotel (4T), located in Sandton, a hub for both tourism and business, and where there are plentiful shopping opportunities. We head east this morning into the state of Mpumalanga. Our journey follows part of the famous Panorama route, which includes Pilgrim’s Rest, declared a national monument to the days of the late 19th century gold rush. Weather permitting we will make a stop at God’s Window for an amazing view from the top of the Drakensburg Escarpment, several hundred metres down to the Lowveld below. We continue to the Protea Kruger Gate Hotel (4T) or Protea Hotel Hazyview (4T) for a three night stay. Dinner is included tonight. An unforgettable day as we embark on a full-day game drive in the iconic Kruger National Park. Our 4x4 safari vehicles offer the best views of the surrounding area and hopefully all of the ‘big five’- lion, elephant, buffalo, leopard and rhino. There is always something to see as nearly 150 different species of mammal reside in the park, together with hundreds of bird species and the Lowveld flora. After our fascinating day we return to our hotel. A full day at leisure. You can relax at the poolside of our hotel, or alternatively you can return to Kruger National Park on an optional game drive for more magnificent wildlife viewing. This morning we drive to Johannesburg Airport and fly to Port Elizabeth, located on South Africa’s Eastern Cape and named in 1820 by the governor of Cape Colony after his late wife. On arrival we transfer to the Protea Marine Hotel (4T) for an overnight stay. We leave Port Elizabeth this morning and head west to Tsitsikamma National Park, now part of the wider Garden Route National Park. We stop at Storms River and view the forest and famous dramatic coastline. Later we continue to Knysna, located in the heart of, and synonymous with, the Garden Route. We stay for two nights in this popular town, at the Protea Knysna Quays Hotel (4T). This morning we board a ferry sailing across the Knysna Lagoon to the western headland. On arrival we are taken up into the Featherbed Nature Reserve. Stops are made at the magnificent viewpoints and our specialist guide highlights the history of the area together with its flora and fauna. There is time for an optional guided walk through the coastal forest and fynbos before a tasty included lunch. Later we return to Knysna where the remainder of the day is at leisure. Leaving Knysna behind, we cross the Outeniqua Mountains that separate the lush coastal area and the more arid Klein Karoo. We arrive in Oudtshoorn, the ostrich capital of the world, where we have a guided tour of a working ostrich farm. After our fascinating tour we continue our journey west to Cape Town. We stay for four nights at the President Hotel (3T+), located in the popular Bantry Bay area. This morning we embark on a half-day tour of this world-famous city, that has a backdrop of Table Mountain, which, together with Lion’s Head, Signal Hill and Devil’s Peak, wrap three sides of the central ‘city bowl’. Weather permitting we will take a cable car to the top of Table Mountain for some amazing views. The afternoon is free for you to enjoy Cape Town at your leisure. Cape Town sits at the northern end of the Cape Peninsula and our journey today takes us to the extreme south of the peninsula to the Cape of Good Hope and Cape Point, the majority of which is encompassed by Table Mountain National Park. We also make stops at Hout Bay, Simon’s Town and Boulders Beach, home to the endangered African Penguins. After an unforgettable day we return to Cape Town. A full day at leisure. South Africa is rightly proud of its wine industry and today you will be able to take an optional winelands excursion which includes a cellar tour and tasting of local wines. Alternatively you may wish to travel to the Victoria and Alfred waterfront with its wide selection of top-class shops and restaurants. Some free time this morning before we transfer to the airport for a scheduled South African Airways flight to Johannesburg and onward flight to London. Arrival at London Heathrow Airport where you will be met and guided to your Titan vehicle, for the journey home.